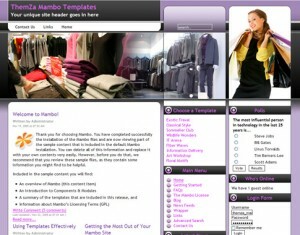 Shopping Therapy, the new Mambo template release we have made ready to download for you today, will take you out of the boring daily routine mood to a mind refreshing tour through the best shopping areas around. The Shopping Therapy Mambo template is a fashionable skin solution for your e-store focused on offering clothing or shoes collections and accessories, or your fashion portal where you chronicle the latest trends and pret-a-porter events in your region or on the global stage. This entry was posted on Monday, May 31st, 2010 at 3:57 pm	and is filed under Mambo. You can follow any responses to this entry through the RSS 2.0 feed. You can leave a response, or trackback from your own site.